Recently we have made friends with a beautiful singer/songwriter named Maria Daines. She is a strong animal activist who uses her talents to raise awareness of animal injustices; she even supported ‘Pink' on her U.K tour! She received an email about a dog in Spain. It affected her so much she has started up a myspace, written songs for her, taken up a petition collecting over 10,000 signatures. She forwarded us the email she received about this dog. It contained the full story and a collection of photos. This story has broken my heart. Never in my life have I read such a horrifying incident. I have cried so much I can't cry any more. Sleep is no escape as I find myself waking during the night, thinking of it and being upset all over again. This story will haunt me for the rest of my life. This is a story of a dog. A stray. Not that much different to any other street dog in Spain. Until one day when she was rescued off the street by a shelter, one of only a few that exist in Spain as they have very little sympathy for animals and consider the strays as rubbish. The name of the organisation was the Protectora de Animales de la Ribera "RIBERCAN". They named her Regina. She was a mastiff cross around 5 years of age. After reading Regina's story I have made the decision not to include the details of what happened to her but I will give you a brief overview and you can go to the site to read more if you choose. The shelter had been subjected to vandalism and break-ins in the past, but 5 weeks ago, the night of 29th of May 2008 was going to be different. On this night, a person or persons broke in to the shelter. They destroyed several fences to get in, and smashed cages. Then they found Regina. 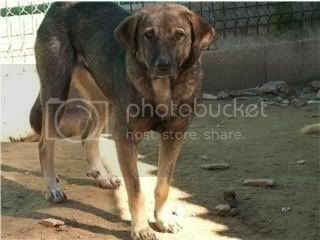 Regina was a timid dog, scared and easily afraid and would have been such an easy target. Again, I will not go in to details, but they tied her legs, sexually assulted and violently raped her before torturing her to death. These facts are true. I have the photos of the crime scene and of Regina's battered broken body. I think the worst part of this situation is that there are NO animal protection laws in Spain. So whoever is responsible for this will never be caught, and never be punished. Although the shelter rang the police they didn't bother to investigate. In their opinion, it was only a dog. Each Spanish region has its own legislation for animal protection; some had none until very recently. The laws are seldom taken into consideration although the abuses are truly shocking up and down the land. Even when the SEPRONA, the arm of the police that deals with environment and animal abuse, investigates and reports that prosecution is needed, police act slowly or not at all. Maria's page dedicated to Regina is called ‘Justice for Regina' in the hope that people do not forget her and how she suffered as do many many strays in Spain from man's deliberate cruelty. She also started a petition to give to the Spanish government which recently closed at 10,000 signatures. She has also written the most beautiful song titled ‘Justice for Regina' with the words in her latest blog.
" The lack of effective ANIMAL PROTECTION in Spain is the driving force behind this awareness campaign . Through the compassionate efforts of animal advocates, activists and members of the public worldwide, I truly believe we can help to gain legal justice for Regina and support the courageous shelter staff who are protecting the remaining dogs in their care". Please show Maria that we care in Australia also, although we cannot sign the petition as it has closed, add her myspace, leave a comment of support and listen to her song for Regina. If you are reading this on our website and do not have myspace, send us an email on our ‘contact us' page and we will forward your letter of support to Maria.